If you're looking to upgrade your PC to play more advanced games or handle other complex, graphics-heavy information, one of the best places to start is by upgrading your graphics card. The Graphics Processing Unit (or GPU) is the powerhouse allowing your computer to run complicated software, and many modern games require you have a decent one if you want to play them the way they're meant to be seen. Here's how you can install a new GPU into your PC. PC is off: Power down your PC and unplug it before touching the internal hardware. Power Supply Wattage: Make sure your PC's power supply can handle the power-hungry graphics card. The general rule to follow is your power supply is graded at twice as much power as your graphics card consumes. If your new GPU says it's going to run at 200 watts, your power supply should be able to handle at least 400 watts. If the power supply can't support the new GPU, installing the new card without first upgrading your power supply could cause your system (including your new GPU) to short-circuit, causing all sorts of damage to your PC. Helpful tools: You should probably invest in an anti-static bracelet, and you'll need a Phillips-head screwdriver. GPU Drivers: Uninstall your old GPU drivers on your computer. How to do this will vary depending on the make of your GPU, but most GPU's (including Nvidia and AMD) have programs you can run to take care of this. When you install your new GPU's drivers, it will most likely prompt you to uninstall your old ones. Uninstalling the old one beforehand just helps things run a bit smoother. Remove old GPU: You may also need to remove your old graphics card, if there is one. It's hooked into a slot on the motherboard, and you'll probably need to unscrew it from the retention bracket keeping it anchored to your PC before removing it from the motherboard. This screw will be connected to the outside of your case, where you normally plug your monitor into your graphics card. Alright, you've removed the old GPU (if necessary), so it's time to install your new one in. You've got your anti-static bracelet on, and your PC is still unplugged. Remove the side panel of your PC case. There are usually a few screws on the top or bottom securing it, but sometimes the panels just slide off. Find the PCI-e slot on your motherboard. It shouldn't be terribly hard to identify — it's the only place your graphics card will fit. Push the card into this slot until the security connectors click into place. Screw the rear bracket into place, which will keep your card from moving around as you plug things into the different ports. Connect any power cables your graphics card requires. They will connect directly to your power supply. Screw the side panel back onto your PC case. Connect your monitor to your graphics card through the open ports on the back of your PC case. This may be through an HDMI cable, a DVI cable, a VGA cable, or some other connection. Most monitors (and GPUs) have several options available. 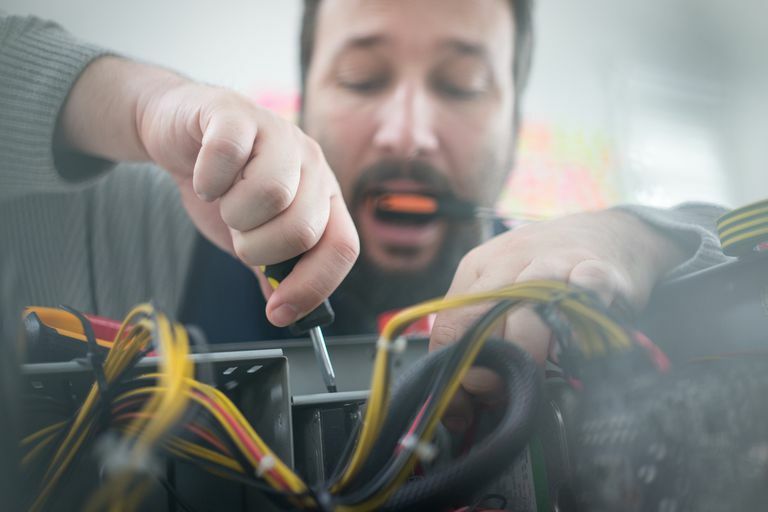 Once you reboot your PC with the new card installed, you'll need to install new drivers to make sure your operating system can communicate with it effectively. Trying to run games before you install the drivers will result in a lot of frustration and crashing. If you bought your card new, there should be software or instructions included on how to install the new drivers. Otherwise, go to the website for your card — you should be able to find instructions for how to install those drivers there. Once your graphics card and drivers are installed, restart your PC to give everything a chance to get locked in. Many GPU companies have software that will help you keep your drivers updated and alert you of any issues with your card to keep in mind.